Before we stopped bringing our oldest dog to the groomer, due to her heart failure, I noticed the groomer using a detangler and conditioning spray on her. I never knew they had detangler sprays for dogs, but wished I had known about it earlier, as it would have saved a few butcher jobs on our lhaso apso years ago, and our Lily, who is a maltese/silky terrier mix. I have always had issues with mats with her fur, and usually kept her hair cut short to help manage and limit the mats. But, if I had the Avocado Mist conditioner detangler from EQyss, I could have let her hair grow out. Now that we have to bath and groom our senior dog at home, I am happy that I own products like this conditioner/detangler as it makes brushing her coat easier. With a few sprays of this leave-on spray, which contains avocado extracts and soothing aloe vera, I can take our dog brush and gentle and easily brush through our dog's coat. Lily finds brush time relaxing, and I don't have to have someone hold her in place while I struggle to brush her. Instead, she now crawls up on my lap, sits for the spritz here and there, and then lays down and lets me brush her. I can't get over how well this product works, and how it leaves her coat silky smooth and shiny. And, now that the cold weather is upon us, this spray will come in handy when her skin can get dry from the dryness inside and cold outside. 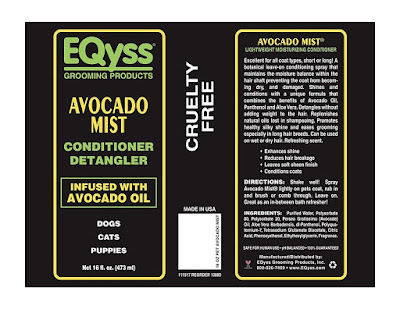 This detangler and all other EQyss products are made in the USA and are cruelty-free, and made without harsh chemicals -- as a pet owner, I appreciate this, as it is hard to find pet products that are safe for our pets. 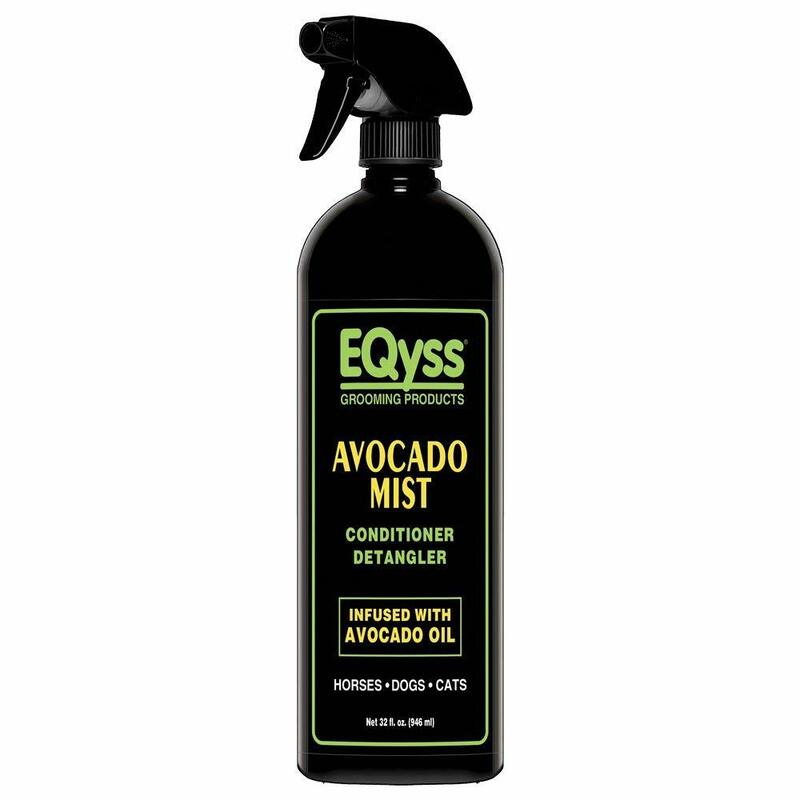 With the holidays fast approaching, why not pick up a bottle of this Avocado Mist Conditioner/Detangler from EQyss to add to your pet's stocking. It is perfect for dogs, cats and horses, and will make brushing and caring for your pet's coat easier, and more enjoyable for you both. 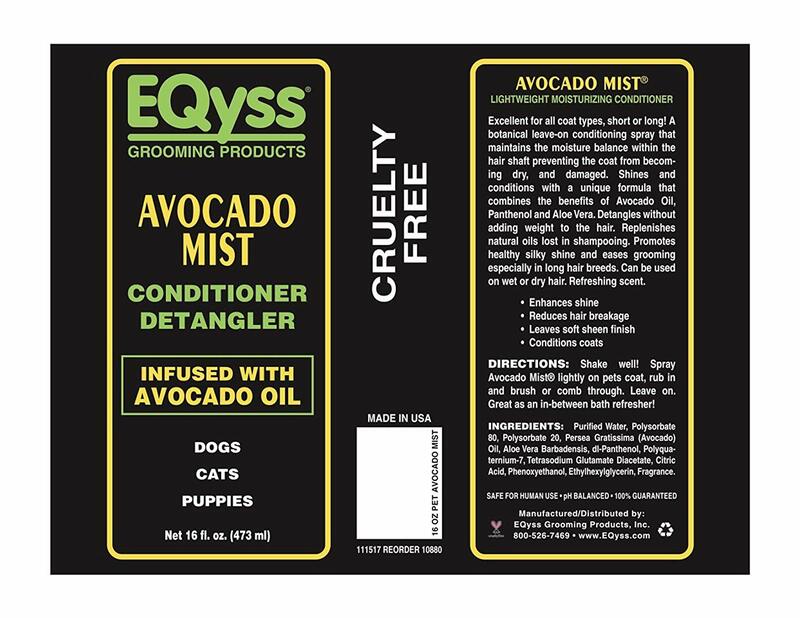 "EQyss Avocado Mist Detangler & Conditioning Spray for dogs and cats delivers hydrating conditioners in a convenient leave-on spray. Created with avocado extracts and soothing aloe vera, Avocado Mist does not contain heavy waxes, synthetic polymers, or silicone. The result is a nearly weightless, fine spray that enhances skin moisture levels and coat shine. It even has sunscreen, a worthwhile benefit for many dogs and cats. Dog and cat owners know that their pets can easily get dry, irritated skin, especially if they need frequent baths or live in a dry climate. Prevent problems by making Avocado Mist part of your pet grooming routine. It's particularly handy for long-coated dogs that need extra attention to keep the tangles at bay. EQyss products are American made, cruelty-free, and guaranteed effective without the use of harsh chemicals. Mary's offers EQyss Avocado Mist Detangler & Conditioning Spray in the 16 oz. spray bottle size. No alcohol, silicones, wax or polymers. Botanical extracts including avocado & aloe vera."